HALIFAX (March 24, 2003) – The first HALIFAX SYMPOSIUM ON PALESTINE – A LAND, A PEOPLE – A HISTORY, A FUTURE was successfully held on the weekend of March 15-16 at Dalhousie University. Over 30 people registered for the Symposium and, including the social function “An Evening with Palestine,” more than 60 people participated from four areas of Nova Scotia in all the proceedings and events. The atmosphere at the venue of the Conference was warm and lively. Everyone listened with rapt attention as representatives, from eminent historians to student youth, shared their knowledge and experience with the participants. There was a feeling amongst that something new, something very positive, was beginning to take shape, and they are participating in the creation of this new. ON BEHALF of the different sponsoring groups*, we are convening this morning the HALIFAX SYMPOSIUM ON PALESTINE – A LAND, A PEOPLE – A HISTORY, A FUTURE. It will deal with one of the most pressing issues confronting the world today – Palestine and the right of the Palestinian people to self determination, the ceaseless striving of the Palestinian people to exercise control over their own lives which lies at the epicentre of the entire resistance of humanity to imperialist war and subjugation. 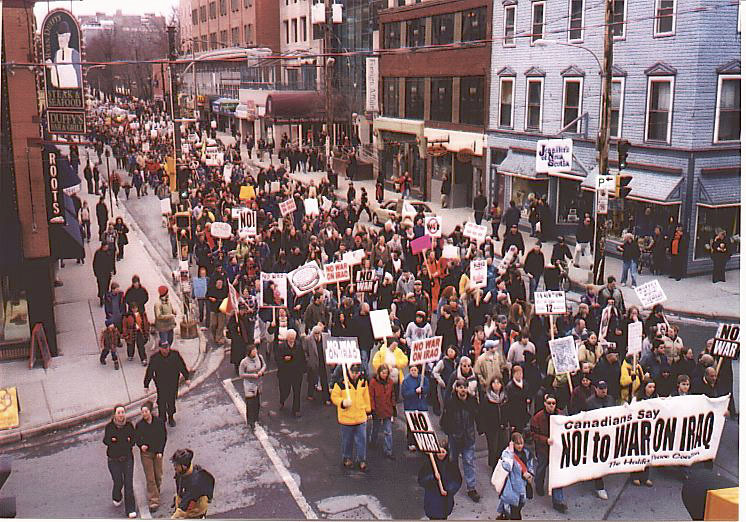 We are reprinting an article by Halifax journalist SIMON HELWEG-LARSEN, who viewed first-hand the premeditated attack by the HRM police force on the anti-war rally on the first day of Bush’s war. It is a companion to, and substantiates, our main article “The day the war broke out.” The attack and the brutality cannot be viewed as merely a local event, however. On the other side of the continent, later that same day, San Francisco police arrested 1,400 anti-war demonstrators. On March 22nd, Montreal police attacked and arrested many youth demonstrating outside the U.S. Consulate as part of the rally of over 200,000 Quebecois against the war. (Halifax, 6:22am Fri March 21, 2003 / Modified on 3:37pm Sat Mar 29 ’03) – EXCESSIVE force was used by Halifax police officers at Thursday’s peace demonstrations. Without warning, police attacked the crowd, selectively arresting organizers, using shock tasers and agression beyond the necessary for this threatless crowd. HALIFAX (20 March 2003) – SINCE the “official” war will surely begin before this issue is off the newsstands, outlining the terror and mayhem of “shock and awe” bombing raids in a city the size of Paris is perhaps an unhelpful conjecture: it will be massive, it will be brutal and it will be deadly – “liberation” as defined by the American Empire always is. No to war on Iraq! Prepare now for the war measures which will accompany the war!